IMP-H (Interplanetary Monitoring Platform, Explorer 47) continued the study begun by earlier IMP spacecraft of the interplanetary and magnetotail regions from a nearly circular orbit, near 37 earth radii. This 16-sided drum-shaped spacecraft was 157 cm high and 135 cm in diameter. It was designed to measure energetic particles, plasma, and electric and magnetic fields. The spin axis was normal to the ecliptic plane, and the spin period was 1.3 s. The spacecraft was powered by solar cells and a chemical battery. Scientific data were telemetered at 1600 bps (with a secondary 400-bps rate available). The spacecraft was turned off on October 31, 1978. IMP-I (Explorer 43) continued the study, begun by earlier IMPs, of the interplanetary and outer magnetospheric regions by measuring energetic particles, plasma, and electric and magnetic fields. A radio astronomy experiment was also included in the spacecraft payload. The 16-sided spacecraft was 182.12 cm high by 135.64 cm in diameter. The spacecraft spin axis was normal to the ecliptic plane, and its spin rate was 5 rpm. The initial apogee point lay near the earth-sun line. The solar-cell and chemical-battery powered spacecraft carried two transmitters. One continuously transmitted PCM encoder data at a 1600-bps information bit rate. The second transmitter was used for transmission of VLF data and for ranging information. Three orthogonal pairs of dipole antennas were used for the electric fields experiments, and one of these pairs was also used for the radio astronomy experiment. The members of the antenna pair along the spacecraft spin axis extended 2.9 m, the members of the pair used in both the electric field and radio astronomy experiments extended 45.5 m, and the members of the third pair were slightly unbalanced, extending 24.4 and 27.6 m, respectively. All four elements perpendicular to the spin axis were to have extended 45.5 m. The spacecraft reentered the earth's atmosphere 2 October 1974, after a highly successful mission. 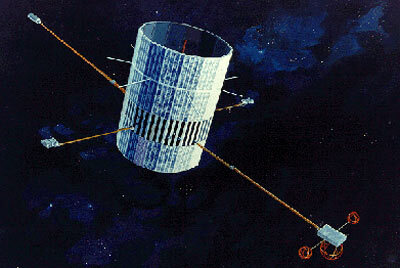 IMP J (Explorer 50), the last satellite of the IMP series, was a drum-shaped spacecraft, 135.6 cm across and 157.4 cm high, instrumented for interplanetary and magnetotail studies of cosmic rays, energetic solar particles, plasma, and electric and magnetic fields. Its initial orbit was more elliptical than intended, with apogee and perigee distances of about 45 and 25 earth radii. Its eccentricity decreased after launch. Its orbital inclination varied between 0 deg and about 55 deg with a periodicity of several years. The spacecraft spin axis was normal to the ecliptic plane, and the spin rate was 23 rpm. The data telemetry rate was 1600 bps. The spacecraft was in the solar wind for 7 to 8 days of every 12.5 day orbit. Telemetry coverage was 90% in the early years, but only 60-70% through most of the 1980's and early 1990's. Coverage returned to the 90% range in the mid to late 1990's. The objectives of the extended IMP-8 operations were to provide solar wind parameters as input for magnetospheric studies and as a 1-AU baseline for deep space studies, and to continue solar cycle variation studies with a single set of well-calibrated and understood instruments.